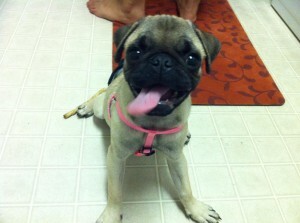 Celine a fawn female pug was from an accidental litter from a backyard breeder born 4/19/2011. Celine is currently receiving flea treatment and getting her up to date on vaccines etc. -Update from foster home. She’s playful and loving as ever! She LOVES attention and enjoys being petted while sitting in our lap! And she loves playing fetch with her chew toys! From day one she’s been doing wonderful in the crate. She sleeps through the night without barking! Definitely takes advantage of her beauty sleep! :) We’re still working on the potty training but naturally, that’ll take some time for a puppy. We were so happy to get the pug. We renamed her Peach. She is adjusting well and has started learning her new name. She has even learned how to sit (mostly). She likes the cats and always wants to play with them. They are becoming used to her but still try to keep distance. She likes looking at the ferret in her cage.